Surat, Dec 3: Congress leader Manmohan Singh on Saturday said he does not want people to take pity on his humble background as he is not in competition with his successor Prime Minister Narendra Modi over this. "I don't want the country to take pity on the basis of my humble background. I do not think I would like to enter in any competition with Prime Minister Modiji on this particular matter," he said here. Singh was replying to a question on why he never talked about his background like Modi often does by saying he used to sell tea at a railway station in Gujarat to support his family during his childhood. 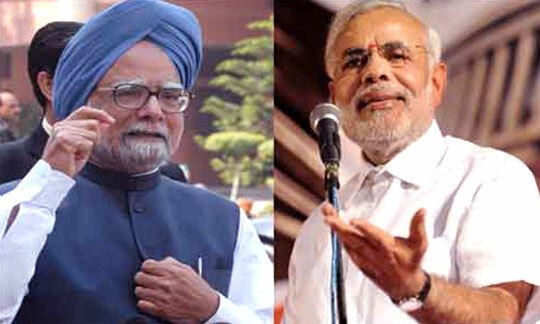 Manmohann Singh, who led UPA government from 2004-14, was born in Gah village in the undivided Punjab in 1932. The former Prime Minister was born into a family of modest means. For the first 12 years of his life he lived in Gah, a village which had no electricity, no school, no hospital, no piped drinking water. He walked for miles every day to school and studied at night in the dim light of a kerosene lamp. When asked once why he had poor eyesight he confessed that it was because he had spent hours reading books in that dim light, according to Sanjaya Baru, who served as media advisor to Singh from 2004 to 2008. His family migrated to Amritsar in India during partition in 1947. He lost his mother at an early age and was brought up by his grandmother. He attended Panjab University where he got his MA in Economics in 1954, standing first throughout his academic career. He completed his Economics Tripos in the University of Cambridge where he was a member of St.John's College in 1957. After obtaining his doctorate in economics from Oxford, Manmohan Singh worked for the United Nations during 1966-69. From 1969 to 1971, he taught International Trade at the Delhi School of Economics. Over the 1970s and 80s, he held several key posts in the government like such Chief Economic Advisor (1972-76), Governor Reserve Bank of India (1982-85) and Planning Commission head (1985-87). In June 1991, Prime Minister P.V. Narasimha Rao entrusted him with the job of Finance Minister when he carried out several structural reforms that liberalised India's economy.